Something fascinating happens when hand-drawn illusions of spaces, theatrical lighting and a purpose-built space comes together in an installation. It appeals to our inner child, with imaginary portals and long corridors to run into familiar yet unfamiliar spaces. It appeals to our adult minds, with deep metaphors of ‘transcendence’ symbolised by drawn staircases, windows and doorways. One might gaze up to look at a pothole window, only to discover it is an object hung like a painting. What seems like a glazed window to the Marina Bay turns out to to be a ‘prop’, suggesting but not giving any view. A series of cabinet-sized drawings suggests utility cabinets. But the drawn windows represent a collage of window views, some dreamy from the afternoon equatorial rain while others clear, blunt views of the flat opposite. A tiny doorway, right-sized for a mouse, playfully welcomes our imagination to enter the exhibition too. An uncanny shadow of a city skyline is projected well above eye level like misty, imaginary clouds might do in an interior if one knew where to look. The installation by Tang Ling Nah transports the viewer into another space: one that is contemplative, anticipatory and a respite of sorts. Jendela gallery is divided into four spaces, named the Entrance, Courtyard, Contemplation Room, and the Safe. Walking through them, under 3 minutes if one was in a hurry, suggests a metaphoric journey into the safe room of our minds. What awaits, without giving the ‘ending’ away, is poetic, simple and likely designed to make you feel peaceful. I can imagine that the effect is enhanced if one visited the gallery again at dusk, rather than the sweltering light of day. As I walked from the Entrance to the Safe, I can’t help but feel a sense of waiting. I waited for something to happen, but nothing does. My impatience was the only thing shown, and perhaps that is one thing the artist wants to draw out, as a point of inflexion. To some extent, if we allow ourselves to be poetic about the experience, the installation is a meeting space to ponder, to chat, or practise mindfulness — ‘the basic human ability to be fully present, aware of where we are and what we’re doing, and not overly reactive or overwhelmed by what’s going on around us’ (Foundation for a mindful society, 2018). With these in mind, one might conclude the work has to be approached with more introspection than a desire to espy a spectacle. 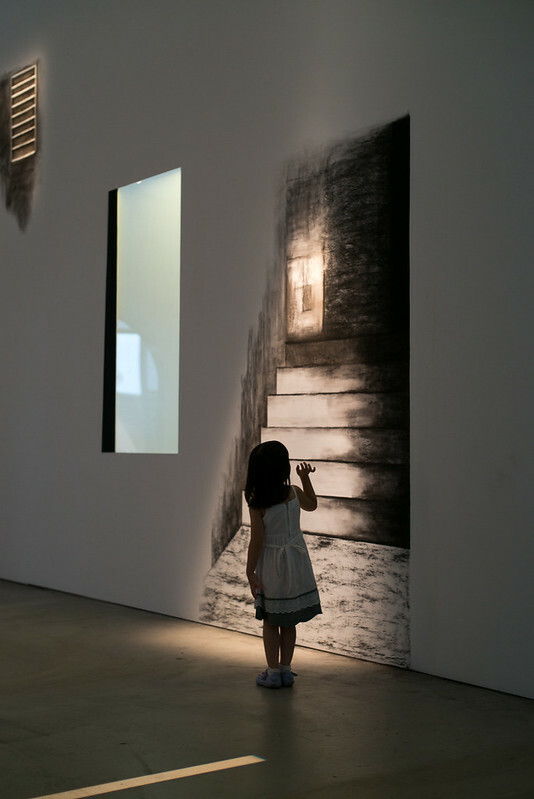 The installation is a collection of views, as much as they are a collection of sketched spaces, waiting to draw us in.